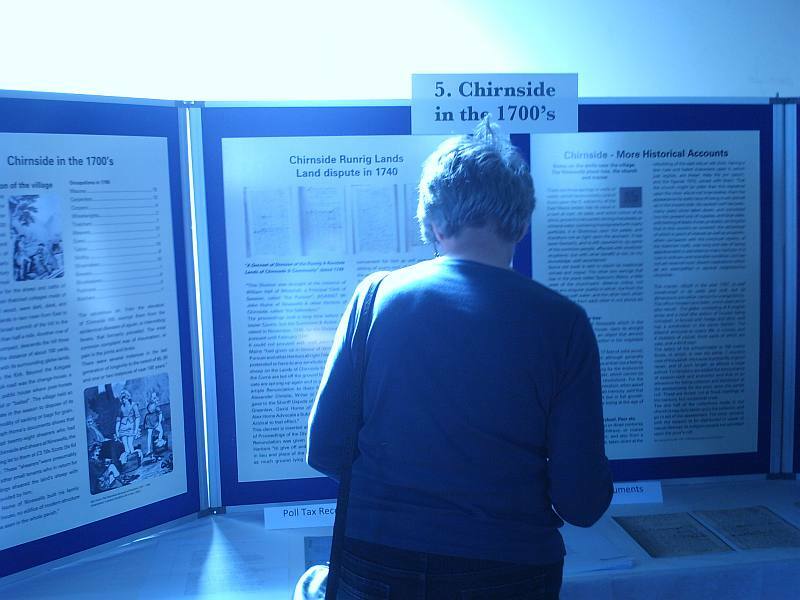 A very warm sunny day for this event held in Chirnside, Berwickshire. 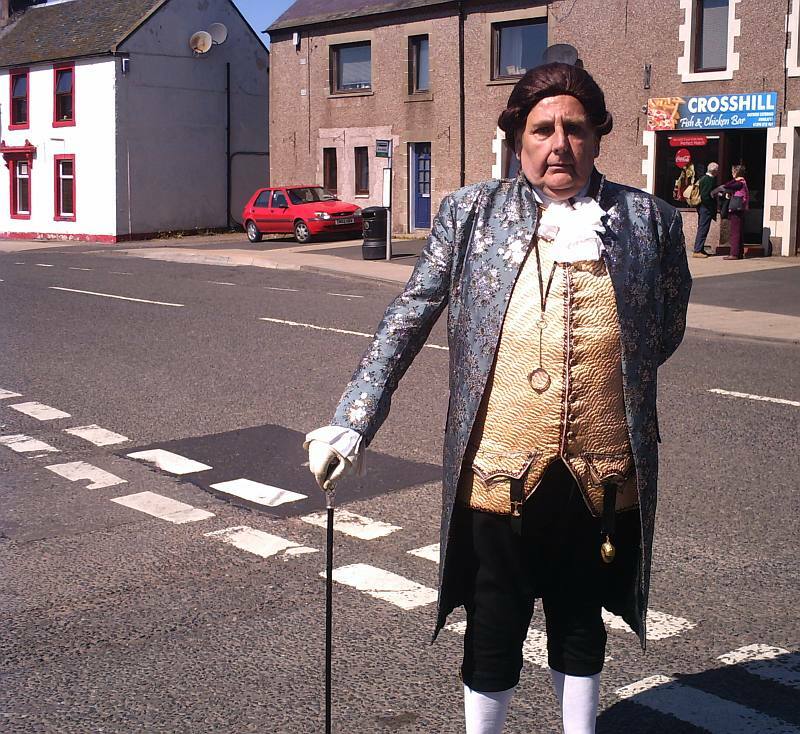 A man dressed in period costume, looking quite like some portraits of David Hume, greeted visitors and directed traffic. Unfortunately I missed Fiona Houston's talk on Life in Georgian Chirnside, due to very slow traffic in front of me, all the way from Greenlaw. Fiona was dressed in period costume. 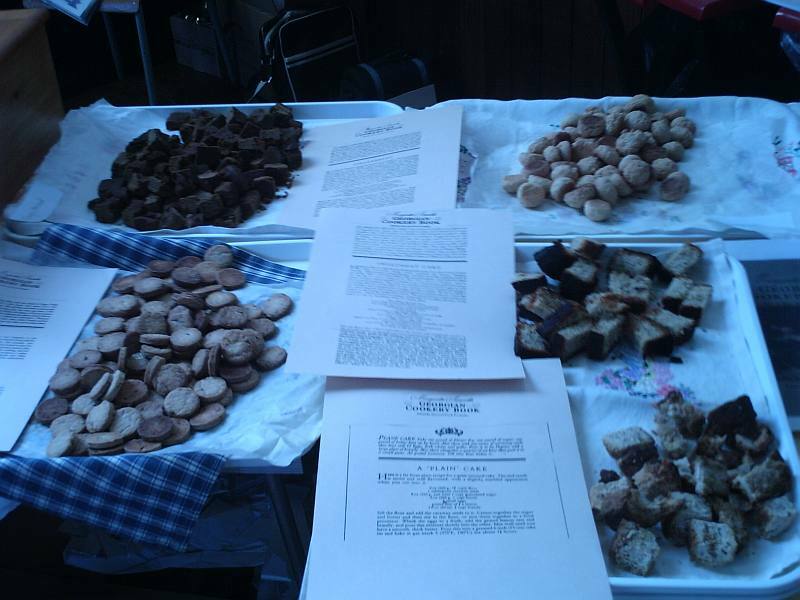 However, there were samples of Georgian gingerbread, macaroons, jumbles, and cake and they were very tasty. There was an interesting presentation with animated slides about the life of David Hume and his works - many of his observations upon life seem very appropriate today - there were bank failures and political shenaningans in his day too. 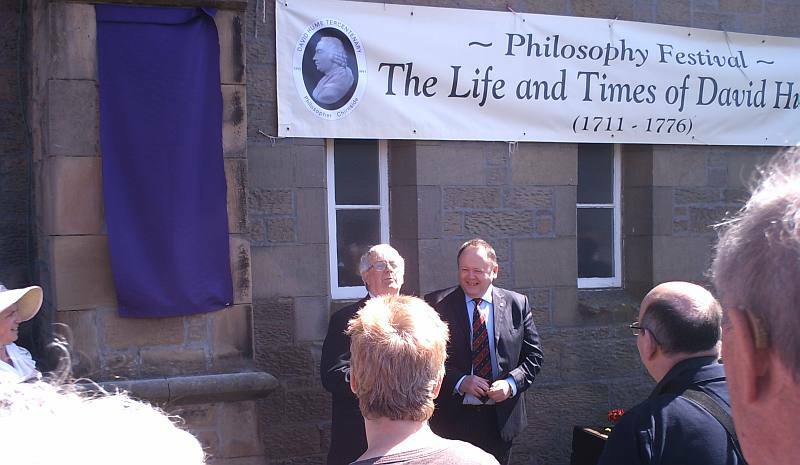 David Hume, the chief executive of Scottish Borders Council, gave a speech about his namesake, David Hume, and unveiled the plaque on the wall of the old church, now the community centre. 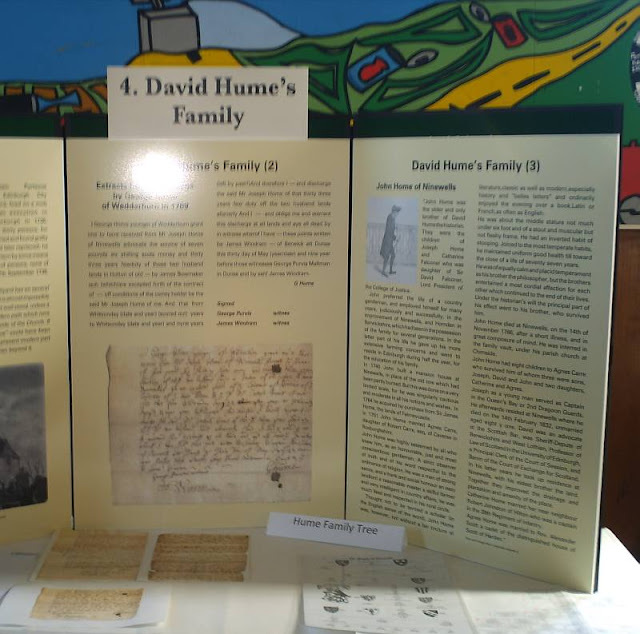 Inside the community centre, as well as the Georgian food, there were 5 display stands, and a table with some interesting letters of the period, and some other documents including David Hume's family tree and a legal case involving David Hume's father, Joseph. There were lots more events in the programme, however, I didn't stay for them. For more details of the programme, see Ronald Morrison's blog on the David Hume Philosophy Festival. Bygone Borderlands - Family and Local History Weekend will take place on Saturday 14th May (10am to 4pm) and Sunday 15th May (11am to 4pm) at The Guildhall, Berwick Upon Tweed, England, TD15 1BN. This is a free event for anyone interested in finding out more about their family history and the local area. 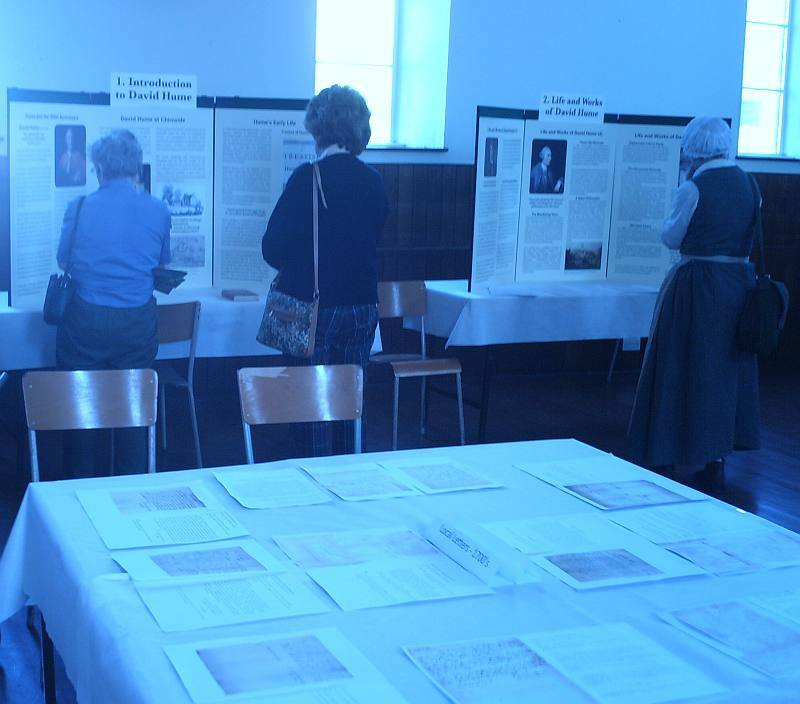 Several local history societies will be putting on displays about their village or town and there will be volunteers available to assist with family history queries. There will also be bookstalls and talks on the subjects. Don’t think this event is just for adults ! Activities for children are also planned ! The last time a similar event was held a record number of visitors attended. Please don’t miss this great opportunity! 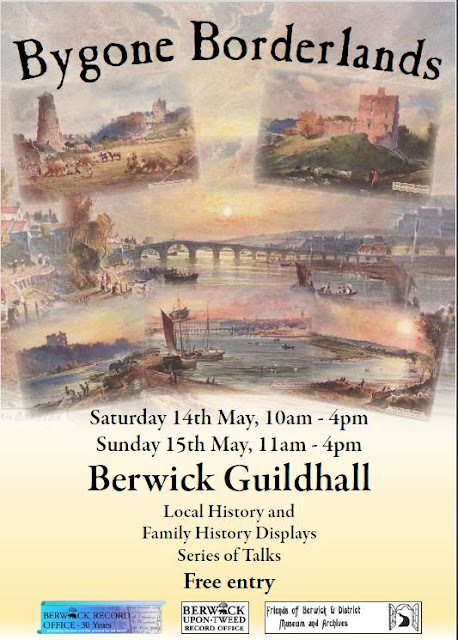 Borders Family History Society will be there, though if there's anything you especially want to see, please contact Mary Thomson on our Contacts page using the contact type Order for Publications. Next week sees the 300th anniversary of the birth of David Hume, not only Scotland’s but undoubtedly one of the world’s greatest philosophers. Hume has been accorded many accolades, Professor Simon Blackburn of Cambridge University for instance describing him as “Britain’s greatest philosopher and since Socrates the most loved anywhere” and the Stanford Encyclopedia of Philosophy describing him as “the most important philosopher ever to write in English”. Although born in Edinburgh, Hume was brought up and spent all his childhood years at Ninewells House near Chirnside in Berwickshire which he always regarded as his home. It is said he never lost his Borders’ accent. He was born on 26th April 1711 under the Julian calendar, 7th May 1711 under the Gregorian calendar introduced in 1752. Accordingly perhaps not inappropriate to celebrate his birth somewhere between these two dates and this will be happening in grand fashion at Chirnside next Saturday (30th). There will be a great deal to enjoy, learn and experience on the day and indeed beforehand and over the summer. From next Tuesday 26th until the following Saturday there will be an exhibition in the Chirnside Community Centre entitled “The Life and Times of David Hume”. The day itself will start at 10 o’clock with a talk by Fiona Houston, author of “The Garden Cottage Diaries, My Year in the Eighteenth Century” entitled “Life in Georgian Chirnside”. At 11 o’clock a chance to view the performance of a play by the children of Chirnside Primary School written by drama teacher Eloner Crawford and entitled “Unanswerable Questions”. Afterwards an opportunity to visit the exhibition, help raise money for some local charities while at the same time enjoying some Georgian food. At 12.30 there will be the formal unveiling of a David Hume Commemorative plaque within the village, this very appropriately being carried out by the chief executive of Scottish Borders Council who just happens to share the same name as the philosopher. Then at 2 00. p.m. a further unveiling this time of an information panel to mark the opening of the new David Hume Walk from Chirnside to Auchencrow. This will be followed by a short walk to Ninewells House Hume’s ancestral home for some welcome drinks. At 3.15 in the Red Lion Hotel, Roderick Graham author of Hume’s highly acclaimed biography “The Great Infidel” will deliver a talk on "Hume, the Man and his Life”. 4.00 p.m. will see a discussion between two philosophers, Alasdair Richmond of Edinburgh University and Peter Millican of Oxford University on “David Hume: the Philosophy”. Much no doubt to ponder and to think on. 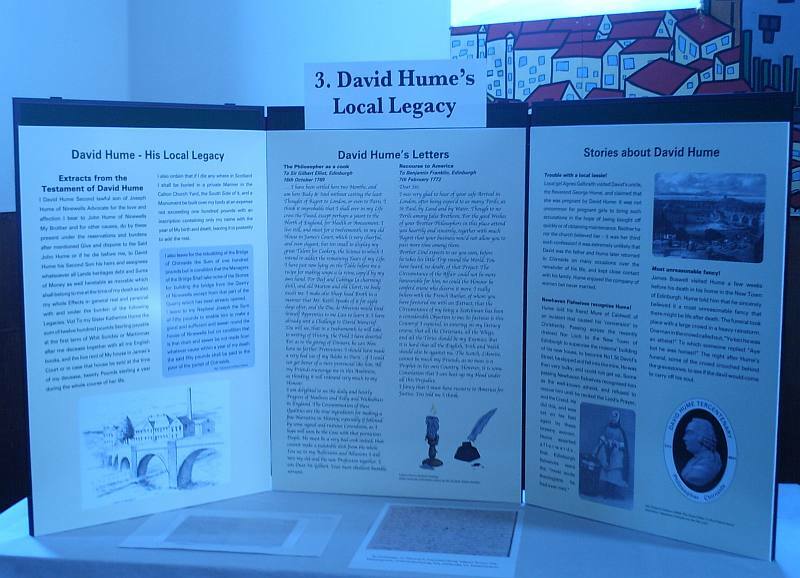 Afterwards at 4.45 p.m. the awarding of the David Hume Essay Prize. The evening starts off at 6.00 p.m. with a Georgian banquet at nearby Paxton House followed by a tour of the House. Tickets for this eventcost £22 but may be hard by come by. 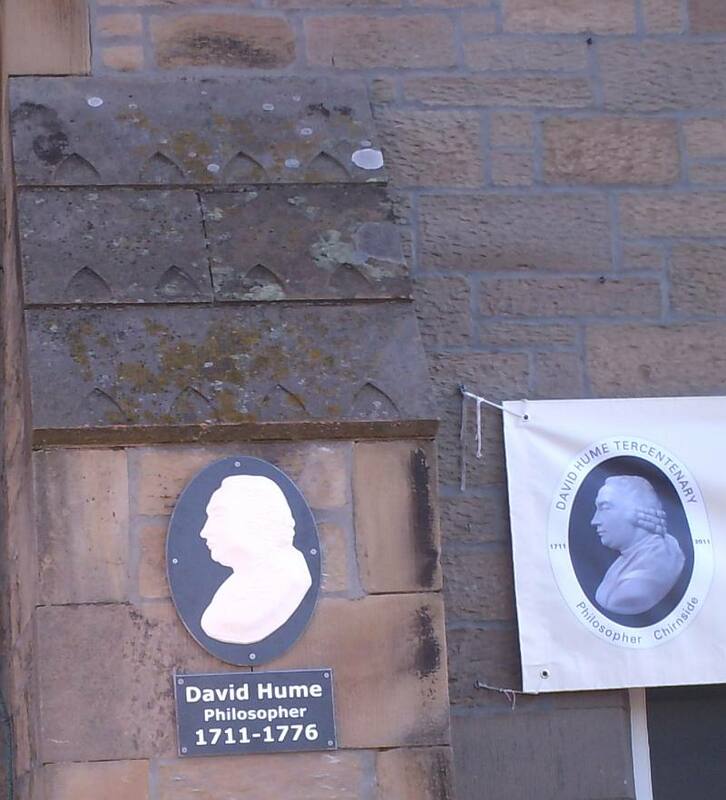 At 7.30 there will be a further talk by Dr. Peter Millican who will explore how the Borders shaped Hume’s philosophy and to round off the day at 8.45 Denise Walton will talk on Hume ‘s contemporary and near neighbour “James Hutton, Father of Geology”. A very full day and as one muses and philosophizes, particularly if the current very warm weather continues, a liquid refreshment might well be appropriate. To mark the anniversary a new beer has been brewed by Hadrian and Border entitled entirely appropriately “Enlightenment Ale” which will be available in hostelries locally. CHEERS! For further information see; http://www.chirnside.org.uk/. From now till Monday 2nd May it will be free to link with relatives you find through LostCousins. LostCousins says that "to take full advantage of this opportunity enter all the blood relatives you can find on the 1881 Census - no matter how distantly-related they may seem. Whilst it's important to enter your direct ancestors and their households (assuming they were recorded on the census), in practice it's the brothers, sisters, and cousins who had families of their own in 1881 who are most likely to link you to your living relatives - so make sure you enter them." You may also like to read my blog from September 2010 on the LostCousins site. The most recent LostCousins newsletter links to another site with part of Kate Middleton's family tree. This site is Anthony Adolph's website and this is descriptive text dealing with Kate Middleton's Olive Lupton (1881 - 1936) ancestral line which goes back via Fairfax ancestry to King Edward III of England. The site also gives Prince William's Fairfax ancestry, it says that Kate Middleton "... is his 18th cousin three times removed and he is her 15th cousin three times removed". I wonder if the Fairfaxes of St Boswells are related to the same Fairfax. Interestingly, Anthony Adolph is one of her distant cousins. The Daily Mail says that Kate Middleton and Prince William are 12th cousins once removed through a common ancestor, Sir Thomas Leighton. You may like to read my earlier blog about Kate Middleton's family tree. A new arrival at the Border Counties Lunatic Asylum near Melrose was sent out with others to work in the grounds. After he had been working for some time, an old inmate, who had been watching him said "Unless you delve (dig) with the rake, and rake wi' the spade, ma man, ye'll no be lang here". 1. The census was held on 2nd April 1911. 2. You cannot scroll through an entire district, only the enumeration district, or institution you have gone into, whereas in previous censuses you could go through an entire district by going forwards or backwards and paying the appropriate number of credits. With this census you would have to find an entry in each enumeration district and then go forwards or backwards. An example would be Nairn Parish, which has 13 enumeration districts or Cawdor Parish, which has 6. This is relevant to those persons doing local history projects or for doing the history of a street where the street might fall within 2 enumeration districts. The Free Headers will give you a description of the enumeration district and can be found on page 2 of the header. 3. In the relationship to head of household column, I have noticed that, for the first time compared to previous censuses, there are many references to adopted children with adopted or adpt or a similar code shown; this, of course, is prior to the official adoption act of the 1920s but appears to be a response to the fertility columns. It did lead me to have to drop one line from my family tree as the 1901 census showed 'son' but the 1911 census clearly stated 'adopted'. There is much greater use of the word step-son or step-daughter. 5. The particulars to marriage column have to be read very carefully; they relate only to the wife of the marriage and will only be found if the wife is present. If the wife is not present, for example, she is away on holiday, but the husband and children are present then the information will not be shown. I found a couple of examples where the enumerator had entered the details for a widow but then put a stroke through the information. It relates only to the marriage of the couple living in the household, not their previous marriages or any illegitimate children that either individual may have had. In this case, Alexander and Alice have been married for 5 years and have had 2 children born alive and still living from that marriage, Jane and James. Minnie is presumably a daughter of a previous marriage of Alexander Cameron, but this cannot be assumed as there are cases in my own tree where the children from a previous marriage of the wife have taken the surname of their step-father and are not shown as step-children although in the 1911 census the use of Step-Son or Step-Daughter seems to be common practice. Duncan and Flora have been married for 20 years and had 8 children born alive; they have 5 children still living of whom two are still living in the same household as their parents. As there is a gap age-wise between Finlay and Annie, I might look for at least one of the deceased children in that period. It also shows that there are three children presumably older than Finlay who have moved away. James and Janet have been married for 30 years had 7 children born alive of whom 5 are still living. One of these 5 children, Janet is living in the same household as her parents. Janet has been married for 6 years and had 3 children of whom 2 are still living, Alexr and Janet. Andrew and Jessie have been married for 14 years have had 6 children born alive all of whom are still living, that is, James, Kate, Williamina, Sarah, Jessie, Agnes. George, Andrew, Hugh, Alexander and Maggie are children of a previous marriage of Andrew senior; Archibald Mitchell is a son from a previous relationship of Jessie Adams. 6. The Industry or Service column can be very useful in that it expands on the information in the employment column. With those working in shops, it states the type of shop and for railway employees it quite often states the name of the railway company. For clerks and typists it states the type of office they work in. For example, Thomas Taylor, age 26, a Railway Surfaceman is working for the N.B. Railway which is the North British Railway Company whose staff records can be found at National Records of Scotland (formerly National Archives of Scotland). 7. The birthplace column usually states the county and place name for those born in Scotland and for those born in England, Ireland, Wales it usually just gives the country name. The enumerator seems to have acted differently in Aberlour Parish, Banffshire in that he put Devon, Devonport as place of birth for my 2 X Great-Grandmother and that is correct. With those born overseas in India, for example, the name of the state seems to be often given. This is a guest blog written by Kenneth Nisbet. The late Audrey Mitchell wrote that Kelso was described by Sir Walter Scott, who attended school there from 1783, as 'the most beautiful, if not the most romantic, village in Scotland'. Early Kelso grew in two distinct halves. Easter Kelso formed in the vicinity of the Abbey, which was founded in 1128 by King David I, and retained its importance as an ecclesiastical burgh until the late 16th Century, by which time the fabric of Kelso Abbey had been largely destroyed and the monks dispersed. Wester Kelso, also known as Faircross, was obliterated in the late 18th Century when the Duke of Roxburgh formed entrance gates to Floors Castle and a fruit garden on the ground occupied by the village. Legend states that plague victims of the 17th century were buried in a mass grave at the Knowes, near the Abbey and bones were found in this area during archaeological excavations. Kelso was primarily a market town and had no large-scale industry until the 20th century. We've extensively revised and improved this volume (previously known just as Kelso) and it's available on CD. 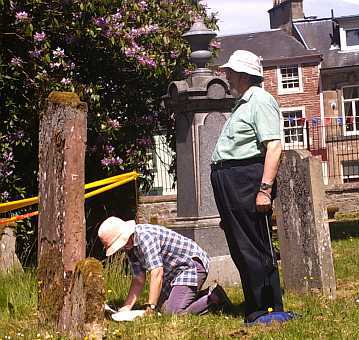 It comprises the details and photographs of 460 monumental (gravestone) inscriptions for the Old Churchyard, Purvis Aisle, Kelso Abbey, and St Andrew's Episcopal Church and the inscriptions on 199 stones lost in 1979 when the surrounding wall was removed from the churchyard and new paths were laid allowing direct access from the Knowes car park to the town centre. We've also included the inscriptions on the Kelso War Memorial, the war memorials in St Andrew's Church, St Mary’s Church, and Kelso High School. It includes a list of ministers, the landowners and tenants on the Hearth Tax assessment in the parish of Kelso in 1690, the men on the Militia list from 1797 to 1801, a plan of Kelso dated 1854. There is a plan of the churchyard and additionally, there's a list of funerals and dates in Kelso 1798 to 1813. This is particularly useful because many of Kelso's inhabitants were buried without a marker, visitors to the parish were sometimes buried without their name being known. Several regiments were stationed in the town, together with French Prisoners of War and their burials are recorded here, as well as an index to the surnames included in the inscriptions. There are more than 500 different surnames included in the inscriptions on the gravestones, and they are: Adams, Affleck, Aimer, Aimers, Ainslie, Aitchison, Aitken, Aitkinson, Aldcorn, Alexander, Allan, Amey, Anderson, Andrew, Archbald, Armstrong, Arniel, Arnold, Auchterlonie, Awburn, Bailey, Baird, Balfour, Ballantyne, Balmer, Baptie, Barclay, Barker, Barstow, Bell, Bennet, Best, Bettie, Biggar, Bishop, Biss, Black, Blackhall, Blackie, Blair, Blaw, Blenkinsop, Blyth, Blythe, Boazman, Bolton, Bonar, Bonthorn, Boole, Borthwick, Boston, Boswell, Bothwick, Bowie, Bowman, Boyd, Broad, Bromfield, Brooks, Broomfield, Brotherston, Brown, Brownlee, Brownlees, Bruce, Brunlees, Buchan, Buchell, Buckham, Buddo, Bulman, Burn, Burnet, Burnett, Burns, Burrows, Cairns, Carfrae, Carss, Cassy, Chalmers, Charlewood, Chisholm, Clark, Cochrane, Cockburn, Cook, Cooper, Cossar, Craig, Cranston, Cranstone, Craw, Crawford, Crease, Crichton, Crosbie, Culbertson, Cunningham, Cunninghame, Curle, Curle, Curle, Curll, Curry, Dakin, Dalgleish, Dames, Darling, Davidson, Dawson, De Borgh, Deans, Dennistoun, Dewar, Dickie, Dickinson, Dickman, Dickson, Died, Dippie, Dixon, Dobson, Dodds, Dods, Douglas, Dryden, Drysdal, Drysdale, Dudgeon, Duke, Duncan, Dunlop, Dunn, Dunnings, Dunsmure, Easton, Edmonston, Elliot, Emen, Ewen, Fair, Fairbairn, Falconar, Falconer, Falkner, Fawcit, Fender, Ferguson, Fergusson, Ferne, Fettes, Finch, Fishburn, Fleming, Fletcher, Flighty, Flintoff, Foord, Forbes, Ford, Forrest, Forrett, Forsyth, Frank, Fraser, Frazer, Frier, Fullerton, Fyfe, Gallon, Gaston, Gibb, Gibson, Giles, Gillespie, Gillies, Glaister, Glass, Glendining, Glindinning, Gordon, Gosset, Gow, Graham, Gray, Greenlaw, Grey, Grieve, Grossert, Guthrie, Haig, Haldane, Hall, Halliburton, Hambley, Hambly, Hammond, Happer, Hardie, Hay, Hedley, Henderside, Henderson, Henry, Herbert, Hermiston, Hervey, Hewat, Heweit, Hewitson, Hill, Hillson, Hilson, Hindle, Hindmarsh, Hislop, Hislope, Hogarth, Hogg, Holman, Holme, Holmes, Home, Honeyman, Hood, Hookes, Hooper, Hough, Howlistone, Huggan, Huie, Humble, Hume, Hunter, Hush, Hutchinson, Hymers, Imieison, Innes, Innes Ker, Irvine, Jack, Jackson, Jaffrey, Jameson, Jamieson, Janitson, Jarvie, Jeffrey, Johnson, Johnston, Karr, Kay, Keenan, Keith, Kell, Kennedy, Ker, Kerr, Kerss, Kinghorn, Knox, Kydd, Kyle, Ladlin, Laidlaw, Lamb, Lamont, Lauder, Law, Lawlee, Lawson, Lawton, Leadbetter, Learmont, Learmonth, Learmouth, Leck, Lee, Leech, Leitch, Leyden, Liddell, Lidgate, Lillie, Limmon, Lindores, Lindsay, Linton, Litster, Loasby, Lockie, Logan, Lorimer, Lundie, Lunn., Lyell, Lyle, Lynn, Mcallister, M’cheyne, Mccoln, Mccorquodale, Mccutcheon, Macdonald, Mcdougal, Mackdougall, Mcdougall, Macintosh, Mackintosh, Mcintosh, Mckay, Mackenzie, Mckenzie, Mckinlaw, Mckraket, Maclean, Mcleod, Mabon, Main, Manl, Marjoribanks, Marr, Marsh, Marshall, Marten, Mason, Mathew, Mauchlen, Maule, Maxwell, Meather, Mein, Melrose, Menin, Merrylees, Michie, Mickle, Middlemas, Middlemiss, Middlemist, Millan, Millar, Miller, Mills, Milne, Mitchell, Mitchelson, Moffat, Moir, Mollifof, Moore, Morison, Morrison, Morton, Moscrip, Moubray, Muir, Munro, Murdy, Murray, Needham, Neil, Nelson, Nesbit, Newton, Nicholson, Nicol, Ogden, Oliphant, Oliver, Ord, Ormiston, Ormston, Oswald, Ovens, Paton, Patterson, Pattison, Paul, Pearson, Peat, Penman, Perfect, Pettigrew, Pillans, Pirie, Pitcairn, Pittillo, Plummer, Porteous, Potts, Primrose, Pringle, Proctor, Purves, Purvis, Pyle, Rae, Ramsay, Ranton, Rathie, Rea, Redden, Redpath, Reid, Renton, Renwick, Richardson, Richmond, Rickets, Riddel, Riddell, Ridley, Ridpath, Rintoul, Ritchie, Robertson, Robinson, Robison, Robson, Rogerson, Rolph, Romanes, Romanis, Ronald, Ross, Routledge, Roxburgh, Rule, Russell, Rutherford, Rutherfurd, Ryrie, Sadler, Sanderson, Scott, Sear, Selkirk, Sharp, Shaw, Sheil, Shiel, Shiell, Shirreff, Short, Simpson, Sitwell, Slight, Small, Smith, Somerville, Spark, Spiden, Spottiswoode, Stalker, Steel, Stenhouse, Stephenson, Stevens, Stevenson, Stewart, Stimpson, Stobo, Stodart, Stoddart, Stormonth, Story, Strachan-Audas, Stuart, Sudden, Swan, Swanston, Swinton, Sword, Tait, Tasker, Taylor, Telfer, Telfor, Thompson, Thomson, Thorburn, Tinlin, Tod, Torrie, Train, Tranent, Trotter, Tully, Turnbull, Turner, Tyrode, Valance, Waddle, Waldie, Waleid, Walker, Wallace, Wardlaw, Watson, Watt, Watters, Waugh, Weatherston, Weddell, Weir, Welsh, Wemyss, White, Whitecross, Whitehead, Whitelaw, Whitelock, Whitlock, Whyte, Wight, Wightman, Wild, William, Williamson, Willink, Wilmot, Wilson, Winter, Wood, Woodrow, Wright, Wylie, Young, Yule. Search the Gravestones Index in the usual way, to see how many stones there are for a surname. The CD costs £10 plus postage. To get a copy, please contact Mary Thomson on our Contacts page using the contact type Order for Publications. Dr Barrow will speak on the men from Tyneside and Northumberland who had social and family connections with Admiral Cuthbert Collingwood and how the latter supported them (or otherwise!) in their naval careers. This is a fascinating study of influence and patronage as well as inherent talent. This talk is on Friday 15 April at 7.30pm at Berwick Parish Centre, The Parade, Berwick-upon-Tweed, TD15 1DF, England. Map. It's next to Holy Trinity Church. Entrance is through the churchyard. The suggested car parking is near the Barracks and Wallace Green. Everyone is welcome. Admission free. Refreshments available.